Autumn - Sundays 1 p.m. - 5 p.m.
Winter - Supspended till we can find a space. Note: This group was orginally founded as Dagorhir group and was one until the winter of 2001. Avalon has since left Dagorhir to join Belegarth. Avalon does not consider itself a Dagorhir organization. All documents that existed prior to 2002 display Dagorhir on them and are being left there purely for historical purpose. Avalon was founded in the early 90s as a splinter group from Pentwyvern. The founders where not satisfied with the political situation in Pentwyvern and decided to form their own group closer to their homes. A few of the founders where Durdel, Noip, Thanatos, Dylan, and Deamon. Many wars where fought over territorial claim and membership with the last of these battles being in 2001. In the early days, Avalon was much more akin to a LARP then it is to its current incarnation as a pure fighting group. People where granted special abilities such as hide in shadows and tracking that do not exist in the core Belegarth rules. These abilities phased out when a new group of younger fighters showed up towards the end of the 90s. Attendance was also at its height during this time, with nearly 100 of people showing up to a practice. "Noip was one of the 12 founding lords of the game. Noip was a no body who just wanted to play when he started with a no politics rule. Dylan was head herald of Pentwyvern and major antagonist to Aberon, whom I invited to be head herald of Avalon. At the time, I was the first head herald (we called the post Marshal), the first Champion, and a Vizier. Too many jobs for me… The first prince then king was Thanatos (i.e. Rutger of SCA – regional knights marsal right now). After I left, he bankrupted the kingdom (some $1,500 spent). Dylan became king next and decided to take credit for everything. Dylan was initially brought in after everything had been created, and after our first event on superbowl Sunday. So, this is nonsense, but he still tried to copyright everything. After Dylan screwed everything and everyone, he fled. This left Noip, who stepped up to become the next king. A year after he became king, I came back and helped rebuild the kingdom again. This is when we proposed Dagorhir of Ohio, but Pentwyvern was too stupid to recognize the need. Noip and I also helped Katahvar get started with a new constitution and training. Later still, Irdaneth was proposed when Avalon was over run by the brotherhood. It flopped before it got started…"
Avalon has suffered its fair share of politics. In 1998/1999, the founders of the group try to create an umbrella organization for all of Ohio called DOO. When this failed due to resistance from the other Ohio groups, Avalon split into two different groups. The majority of the old guard created another group called Irdaneth while the remaining people continued with Avalon. Irdaneth was meant to be an escape from the politics that rifled Avalon at the time. It was also rumored that this new group was suppose to take over Avalon position within the national organization at the time. Of course this rumor was never confirmed as Irdaneth never really took off. Many of the older members who had joined Irdaneth left boffer combat altogether to pursue other things, while the rest rejoined with Avalon. It was also during this time that Avalon's satellite group, Khatovar, broke away and declared its independence. In the spring of 2000, Avalon was again split into two. This time a conflict arose between the Head Marshal, Olaf, and the President, Ivar. Also at this time the Akron University's student organization, University Gaming Society (UGS), removed all non-students from University property causing Avalon to practice at a nearby public park. Olaf and his unit broke off from Avalon and worked with the UGS to establish a practice that happened at the same time and day to prevent members from Avalon attending. Their new group called themselves Amanor. This group only existed until Ragnarok XV during which leaders from both Avalon and Amanor worked out their differences and reformed as Avalon. There still were open hostilities to former members of Amanor and eventually most of them again split off to form several other splinter groups. Later that year, the UGS reformed itself into the University Medieval Society and declared itself the realm of Rhyton. Instead of hostile actions towards Avalon, Rhyton worked with Avalon to provide them space on the campus for their practices as well as scheduling their practices to provide maximum attendance. Just within the past few years, Rhyton has changed it name to Au Tir. In 2005 Au Tir was disbanded, Avalon then moved practices due to location to Goodyear Park in 2011. 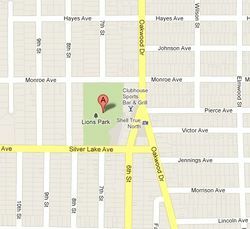 In 2012 due to requests Avalon moved again to Lion's Park and are now located within the city of Cuyahoga Falls. External Link: http://avalon.belegarth.com << Broken?? This page was last modified on 29 October 2012, at 18:01. This page has been accessed 78,540 times.